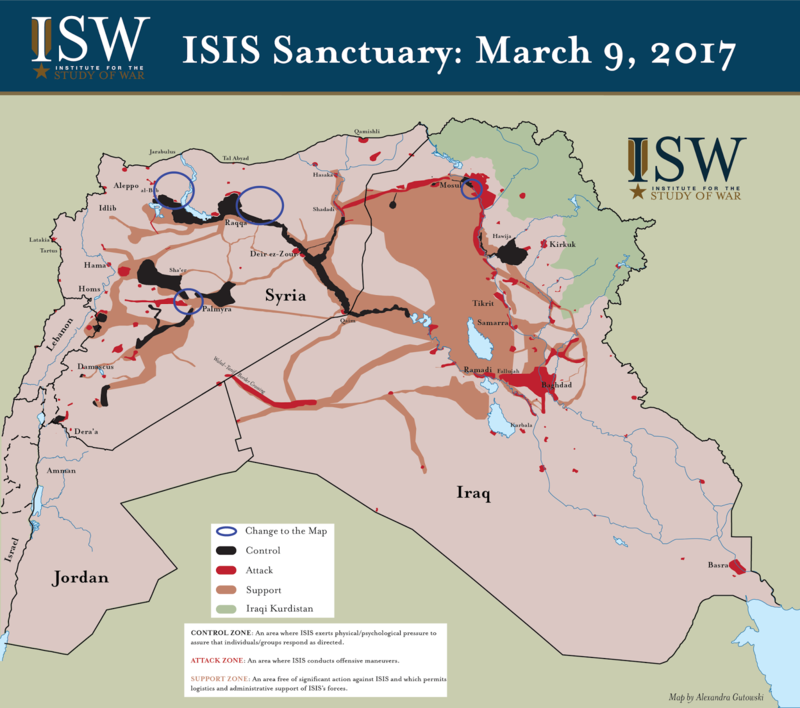 ISIS incurred territorial losses in Iraq and Syria between February 27 and March 9, 2017. Pro-regime forces recaptured Palmyra with the assistance of Iran, Russia, and Lebanese Hezbollah on March 2. Pro-regime forces seized additional villages from ISIS in northeast Aleppo province on March 7 and March 9, recapturing critical infrastructure. The U.S.-backed Kurdish-dominated Syrian Democratic Forces (SDF) continues to clear the countryside east of Raqqa in an effort to isolate Raqqa city, seizing villages along an interior road on March 9. Iraqi Security Forces captured the Ninewa government building in southwest Mosul on March 7 as well. ISIS retains capable ground forces in Raqqa, eastern Homs, and Deir ez Zour provinces that will continue to attack regime forces in Syria. ISIS has also likely infiltrated broader zones across Iraq and Syria that it will cultivate for future spectacular attack campaigns. ISIS appears to be concurrently surging in Afghanistan, which ISIS may increasingly emphasize within its global campaign as it incurs losses in Iraq and Syria that it cannot immediately offset.